A global conflict such as World War I produced an unprecedented level of military might, with the result of death and destruction to millions of people. Along with that came many objectors to war and militarism in general, and also those who objected to that particular war. The government had to deal with them, and this was not a smooth and agreeable process. 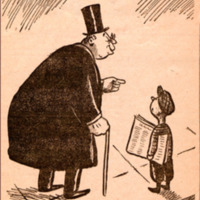 The making of our present system -- which acknowledges conscientious objection as a right of each individual -- had its beginnings in the War Office and in the camps and prisons to which the conscientious objectors (C.O.s) were sent during what was then called the Great War. The objectors were a small minority in the maelstrom of opinion about patriotism and war as a way to "make the world safe for democracy" -- a popular phrase used to justify anything done in this supposed "war to end all wars." One unofficial source states that 3,989 men declared themselves to be conscientious objectors when they had reached the camps: of these, 1,300 chose noncombatant service; 1,200 were given farm furloughs; 99 went to Europe to do reconstruction work for the American Friends Service Committee (AFSC); 450 were court-martialed and sent to prison; and 940 remained in camps until the Armistice was fully enacted. It is likely that the total number of C.O.s was closer to 6,000 than 4,000. There is still much unpublished material about World War I C.O.s, seen by only a few, something that this website will help to end. Hopefully, more and more will be brought to light as we move through the centennial years since the war occurred. Hopefully, this will be true of both personal writings and of other venues used to express opinion. British cartoon "The Upper Crust. 'Why haven't you enlisted, young man? Do you want people to call you a slacker?'" 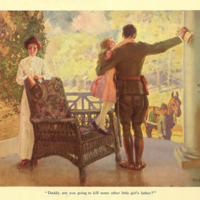 Picture "Daddy, are you going to kill some other little girl's father?"